As Thanksgiving approaches, we at DISC are thankful for quite a lot of things this year. xAPI has seen tremendous interest and growth. The community is larger and more active than ever before. The problem spaces xAPI is being used for, and the challenges being addressed within xAPI itself, are inviting new talent, ideas and know-how into the community. This is large part because of the commitment of those who work with and on xAPI. We are very thankful that DISC’s membership program is active. Several organizations that support xAPI are finalizing details and, today, we are very happy to welcome our first official member, Yet Analytics. xAPI would not exist without the support of many organizations working together for a greater good. However, xAPI would not have advanced as far as it has without The eLearning Guild who has championed this community’s efforts from its first incarnation in 2012. Since then, year after year, the eLearning Guild has continued to grow a larger and larger footprint for the xAPI Community in their events. Last week, DevLearn offered the biggest showing yet for where xAPI is and where it’s headed. Every year, many services and tool providers plan a presence in the Expo Hall for DevLearn, but often an individual vendor’s booth is placed on the expo floor with more consideration for foot traffic and less for whom is drawn to their particular booth. This year, several vendors adopting xAPI asked DISC to work with the eLearning Guild to co-locate their booths together to showcase both the collaborative spirit of the xAPI community, especially among competing vendors AND to promote the interoperability of the tools using xAPI. The result was a first for DevLearn: a concentrated area on the expo floor with like vendors sending people to related (and competing) booths as they worked with attendees and visitors, answering their questions. Our shared area was quite active during expo hours and it is very likely there will be a collective presence around xAPI at other trade events to come based on the overwhelming success of this shared endeavor. DISC Board member Robert Todd and I convened an ongoing discussion as part of xAPI Central, creating a space on the expo floor for vendors to talk amongst each other to collaborate, inform people new to xAPI with both credible and actionable answers, listening and taking notes of questions, concerns and ideas on how the xAPI Community might address the challenge of making xAPI easier to work with, particularly around vocabularies and profiles, and the challenges involved with supporting multiple protocols for authentication. Every eLearning Guild event hosts a DemoFest where practitioners and vendors share examples of their work. Votes are tallied across various categories to recognize outstanding learning applications. This year, the Best-in-Show awards for both vendor and non-vendor went to projects using xAPI and Beacons. We at DISC congratulate Torrance Learning, in the vendor category, and Frazier Smith as an Instructional Designer in the non-vendor category. It is truly inspiring to see awards in multiple categories go to projects making use of xAPI. 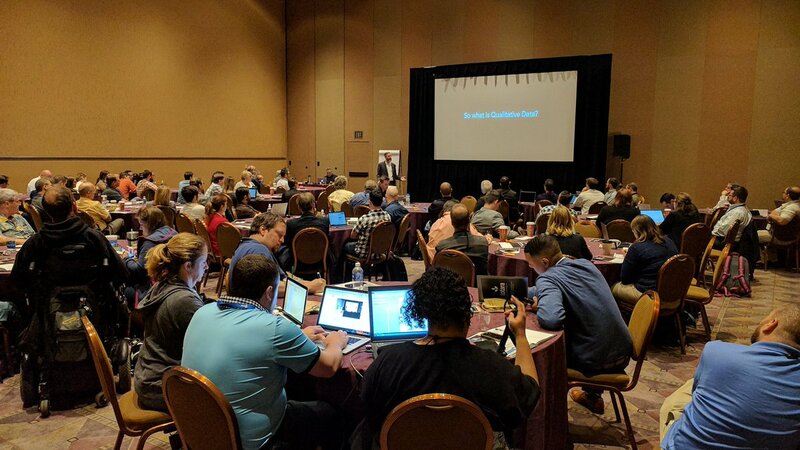 Almost 100 participants started their week in Las Vegas attending the xAPI Camp that took place on Tuesday, November 15. There were multiple campfire talks, 15-20 minutes in length, that addressed getting started with xAPI, predictive analytics, designing for outcomes, content strategy, data visualizations and case studies breaking down implementations of xAPI in innovation groups and in online forums. The breakout sessions, loosely structured, were highlights of this particular camp with multiple project-related discussions, a design jam and even a hands-on tutorial working with making statements to an LRS. Presentations given during the campfire talks at the xAPI Camp are here. DISC is working with ADL to provide recommendations for software certification program(s). We need your input now. If you’re a stakeholder in an organization making decisions about working with xAPI and purchasing software that supports it, we’d really like to talk with you for just 30 minutes. Learning Analytics Policy – Looking for Input!